This is a wonderful love song/ballad that relates to a sailor from the direction of the lady involved. It has gained much popularity of late due to its use in the fourth movie (On Stranger Tides) of the universally enjoyed Pirates of the Caribbean franchise. In doing some research, I found that the song is pretty well referred to by every blogger as a “sea chantey” or “sea shanty”. I must state firmly that it is not and never was a sea chantey/shanty! To reiterate – a sea chantey is a call and response work song designed to coordinate the efforts of a ship’s crew, and this does not have the structure to be utilized as such; call it a forebitter or ballad or simply a love song. More to the point, it seems that everyone hearing any song relating to the sea concludes that the song in question is called a “sea chantey” and I am really surprised no one has yet tagged the opening theme to “The Love Boat” as yet another “sea chantey”… Or maybe they have and I have yet to hear of it. 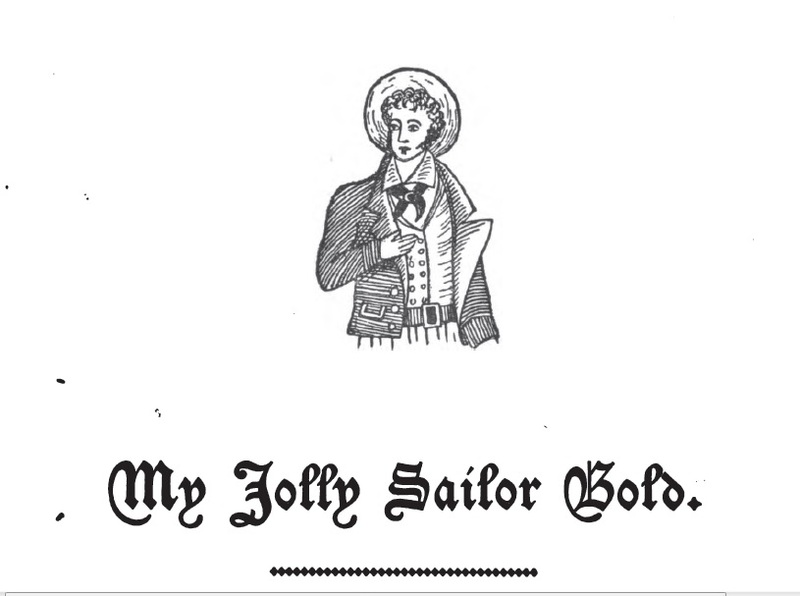 In any event, the earliest version in print that I am aware of is in the book “Real Sailor Songs” by John Ashton, 1891. This does not denote that the song dates from that period, for John Ashton makes it clear that he was collecting “old sailor songs” of a certain age rather than anything of recent vintage. However, much like many songs that enjoyed some time of oral tradition before finally being published, it is difficult to date; it has the hallmarks of a vaudeville or music hall composition and I can imagine it having been published in broadside bills. I have a friend who agrees with that, telling me that it is in the British Library, catalogue # C.116.i.1 “My jolly Sailor Bold as published in London c.1850.” He tells me that he’ll obtain a copy for me and I await this eagerly. A delightful version most recently released is sung in the third person by Danny Spooner in his CD “Sailors’ Consolation” in which he sings it in D major instead of the darker minor keys most people seem to sing it in since it was featured in “On Stranger Tides” (see the video below). It really is a sweeter song of love with no murder or disaster, so it seems to be better served in a brighter key. 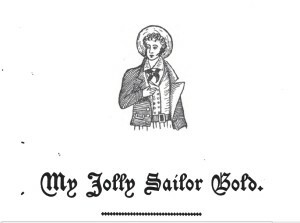 Detail from the book “Real Sailor Songs” by John Ashton, 1891. All for her jolly sailor bold, until he does return. And he frowns upon his daughter, for she loves a sailor bold. But a fig for his riches, all his merchandise, and gold! Onto her tender bosom will she press her jolly tar. Reclining on the bosoms of their jolly sailors bold. And firmly pray, God speed the day, he home will safe return. And there’s nothing can console her but her jolly sailor bold. How I love Gemma Louise Ward! So many songs in history cover similar themes even if not directly connected. Today we might regard these as tropes, and not intended to reflect an actual and specific event, but to reflect commonly held ideas/stories.